Within this review I will be questioning Anno’s want to create community centred work in a world full of power structures, and undertones of simulacra. These are the themes that this review will examine; community, power and the use of simulation. Anno is an environmental activist and so her intentions are almost didactic, to raise awareness of issues surrounding this. However, people don’t like being told things they already know. We know the sea levels are rising, it is well documented. Her angle differs slightly … The driving force is environmental change and ‘Nature Studies’ allows Anno to look at these issues more deeply. She is implicated by her own desires within the system. Inspired by Racheal Carson, Anno echo’s her “call for humans to act responsibly, carefully, and as stewards of the living earth”. Her work also draws on that of Robert Longo, namely his, Men in Cities. 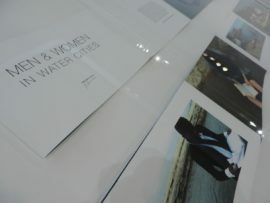 Anno’s video work mirrors this clearly in the titling, Men and Women in Water Cities. The Waterfront Building, University of Suffolk, Thursday 22nd March 2018. Enter through University of Suffolk’s ‘Cargo café’, which has been taken over for the evening by waitresses circulating canapés. Fresh from Anno’s lecture on her work, held within the same building it is difficult to see the work with a clear mind. The hanging of the work is varied from; large format photography, works on paper – some framed, some not, a concertina book – creating a strong visual narrative [fig.1] and a projected video. The exhibition descriptor, penned by Anno talks of Darwin’s, ‘survival of the fittest’ and is aptly placed next to two framed works on paper of animals; ‘Family’ and ‘Amphibians’ rather than the photographs of the Men and Women – perhaps of telling clue of what is to follow. The clearest development, highlighted in both the lecture and the exhibition is her partial departure from abstract paintings – which she had been creating for the last 27 years. Anno subsequently development video and photography works, est 2009. The most notable ‘Men and Women of Water Cities’ – that is why she is here, after all – Ipswich is a water city. Well almost, the intention is there, but Ipswich is a town, not a city. The intention is there. Tenuous at best. One of the main themes identified within this exhibition is community and Anno’s interests lie in nation states. The want to communicate is evident and ‘nothing is more powerful to unite minds than the community of language’ (Moryson, 1903, p.191). Within ‘Nature Studies’ she used English to unite these water cities as a common language. She is trying to say something about these environments and these men and women. She examines how the citizens of the nation states are bound together by several factors; arguably the most important of these being a common language, based upon collective understandings and standardised conventions (Murrill, 2015). However, there is also a feeling that the men and women in these water cities are also bound by the rising water levels and how they have, as a community, ‘begun to train themselves to adapt’ to this situation (Ngcobo, 2011, p.76). True to her environmental stance, within these works Anno is not only examining the relationship of the community, but also the relationship with the environment and animals. Anno was inspired by a trip to the zoo and has also visited and filmed the training of a lion in a reserve. The power structure here is what we may expect; humans asserting their dominance over the animal kingdom – we circle back to Darwin, in reality our chances of surviving head-to-head with a lion are slim. Zoo’s and nature reserves are surely, at best, a watered-down simulation of the wild. Within her wider practice her film, ‘Pieceable Kingdom’ celebrates the animal as the emblem of power. However, what we see is a trained animal and the human with the power. 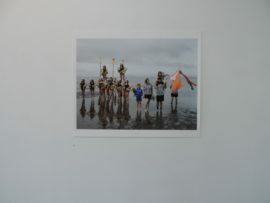 The photographs of ‘Water Cities, Berkeley, Finale’ [fig.2] and ‘Alamada Kids’ which hang in this exhibition document the coming together of people. A staged narrative. Anno wants to bring celebration to her art work, in the same way that sports is celebrated (Anno, 2014) and appears to be doing this by building a relationship between sports and arts – by including them within her practice. There is a notion to simulation within the work, with the use of actors within her film to aid the story telling. It must be questioned if this is just a simulation of water cities or the real thing – or perhaps in the era of the post-truth it does not matter either way. The objective fact, less important than our emotional response to these images (Ball, 2017). The use of simulacra is acknowledged within other areas of Anno’s art practice too, ‘Erasing Las Vegas’ sees her explore Paris, from her hotel room in Las Vegas. Use of editing within the readings is evident, often many words are omitted from the original texts. Interestingly, Anno wants to bring together communities, but then creates spoken word piece such as, ‘The Mirror of Simple Souls’, which removes all religious quantitation’s from the text, changing the intent of the text and possibly isolating the intended audience – the intended community. To conclude there are a couple of power struggles throughout ‘Nature Studies’ – nature versus humans, humans versus animals. It is not clear who wins, the fight may wager on until one of the elements does. However, Anno is the ringmaster here; narrating, editing and directing the story she wants to tell. Anno is documenting history and interrupting it in her own way, wanting to change how we think about nature. Decoding the mystery within texts and their multiple meanings, to convey her individual interpretations (Barthes, 1977, p.19). Much like language the environmental issues highlighted by Anno continue to be a contemporary issue that we continue to try and understand. While the system of language remains unchanged, languages do evolve through time (Miller, 2001, p.299) and so will our understanding of these issues and how we communicate about them. For Anno, this is by moving into television – allowing her to address a mainstream audience, other than the exhibition go-er, further adding to her prowess. We may be able to tame the animals, but the raising water levels may not be so easy to beat. Anno, K. (2014) Statement. [online] http://www.kimanno.com/statement-2/ [accessed 20/04/18]. Barthes, R. (1977) Image, Music, Text. Hill and Wang. Carson, R. (1962) Silent Spring. Houghton Mifflin Company. Jakobson, Jespersen, and Reference. Semiotica. Miller, J. R. (2001) The Handbook of Linguistics. Wiley-Blackwell; New Ed edition. Murrill, R. (2015) Akademie X: Lessons in art and life. London: Phaidon. Porete, M. (1993) The Mirror of Simple Souls. Paulist Press.